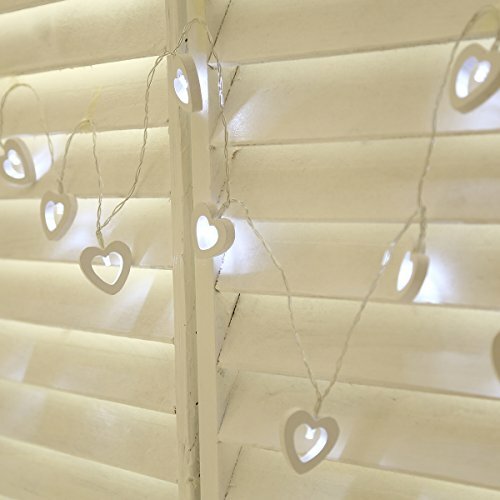 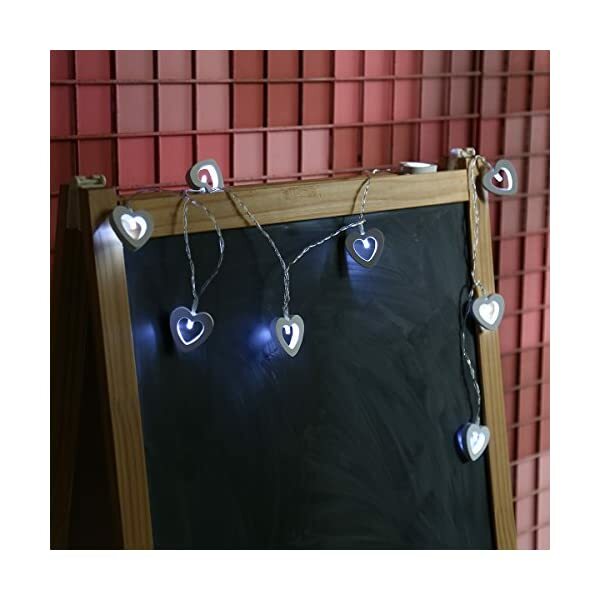 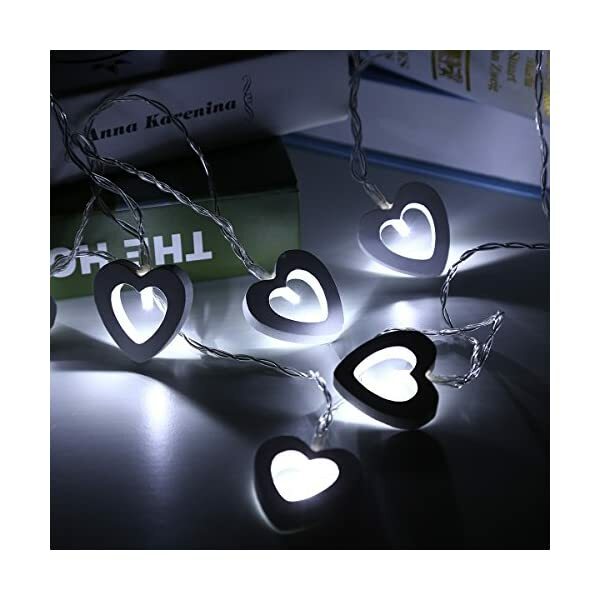 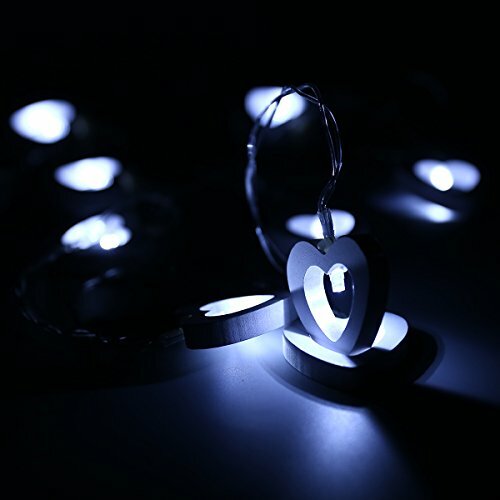 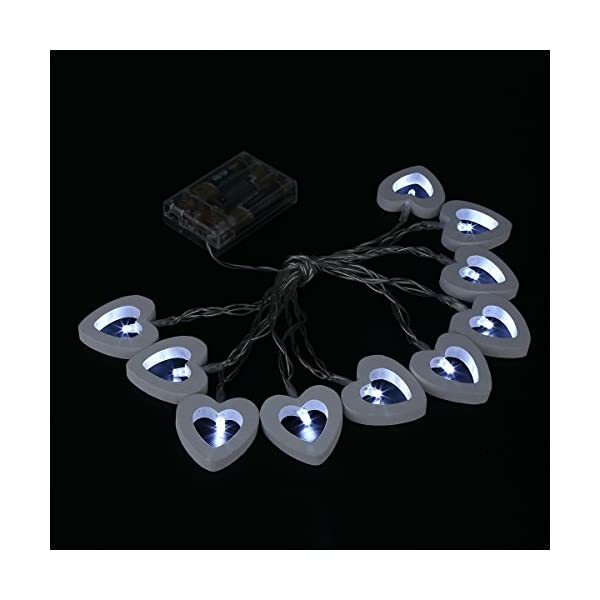 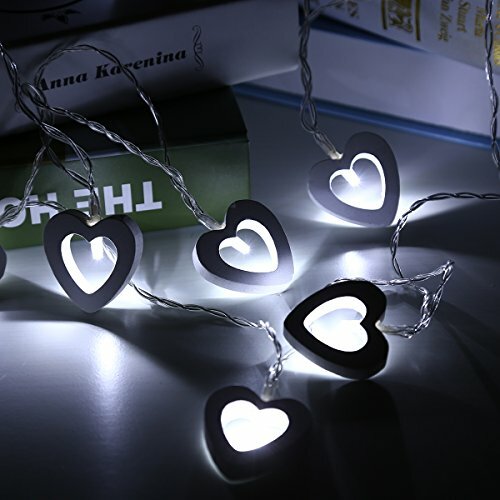 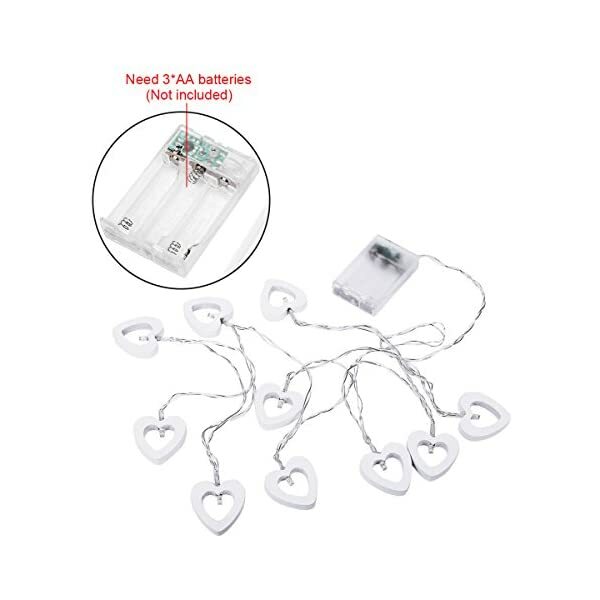 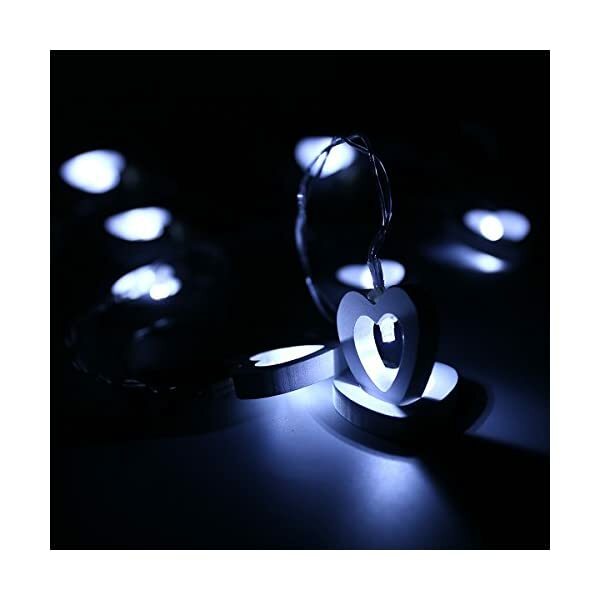 Lovely, elegant and fascinating light design: 10 wooden heart-shape cool white LED string lights with 2.5M/8FT wire length, which subtly enhance the shape of the heart by illuminating from the centre, and will reflect lovely if placed around your mirror or a metal bedstead. 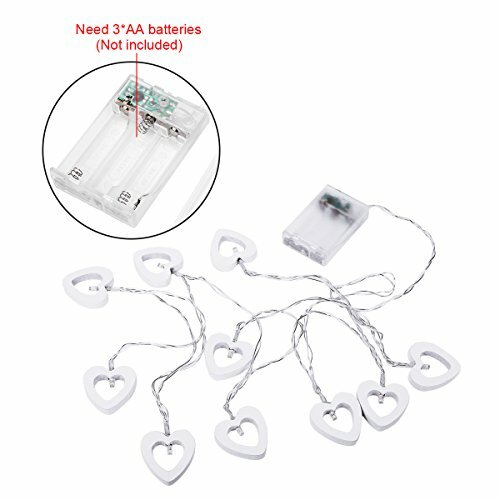 Without hassle of complex operation: Powerd by 3*AA batteries( not included), just install batteries into the battery box and then push the button and start to work;there is no worry about trailing cables or having a plug socket nearby, you can enjoy the beautiful lighting scenes as soon as you want. 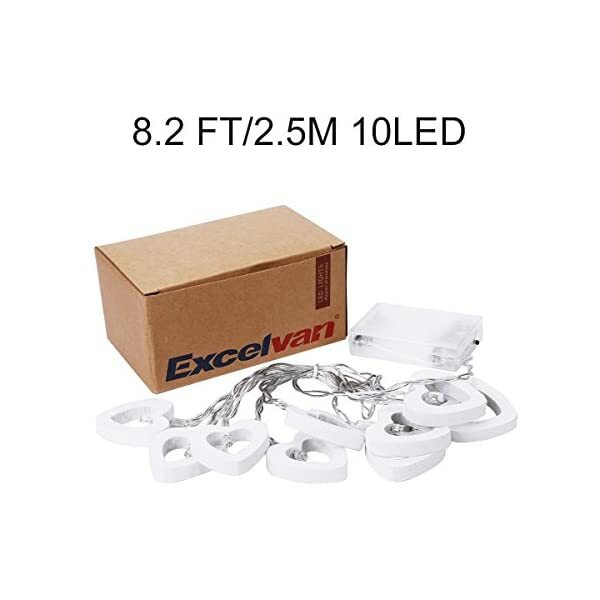 Multi-functional modes for convenience: equipped with 3 operation modes on the battery box: ON/OFF/Steady on. 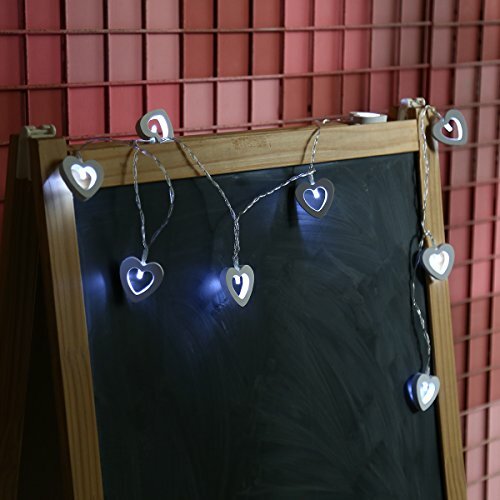 In the mode of steady on, the wooden heart-shape string light has a timer which makes the light work for 6 hours and 18 hours off. 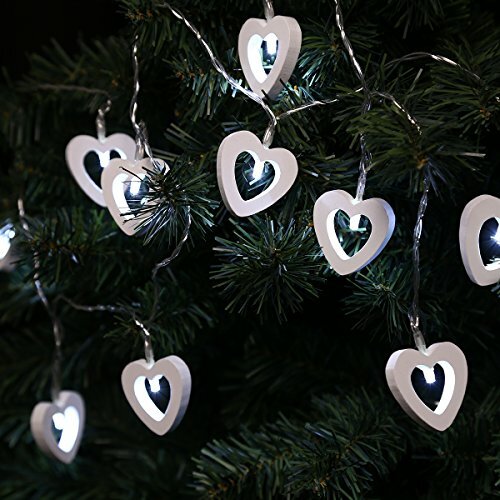 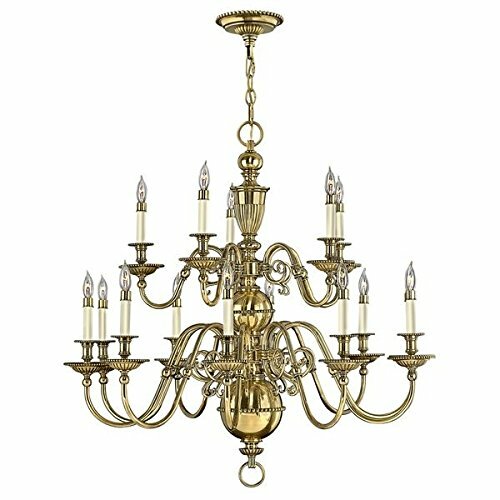 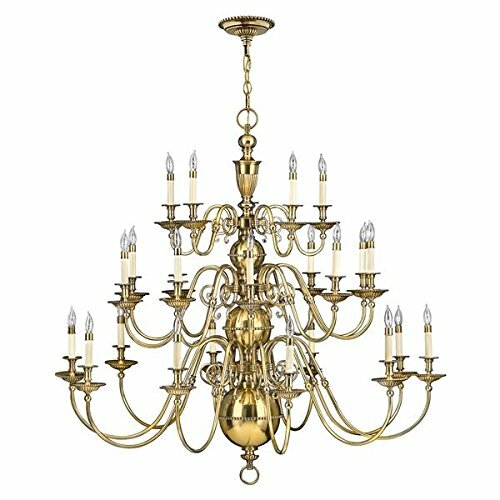 Bring a lovely, elegant and fascinating lighting atmosphere into your house, pubs, mirror, child’s dolls house, bedframe or even the edge of a shelve or bookcase or any places should be decorated. 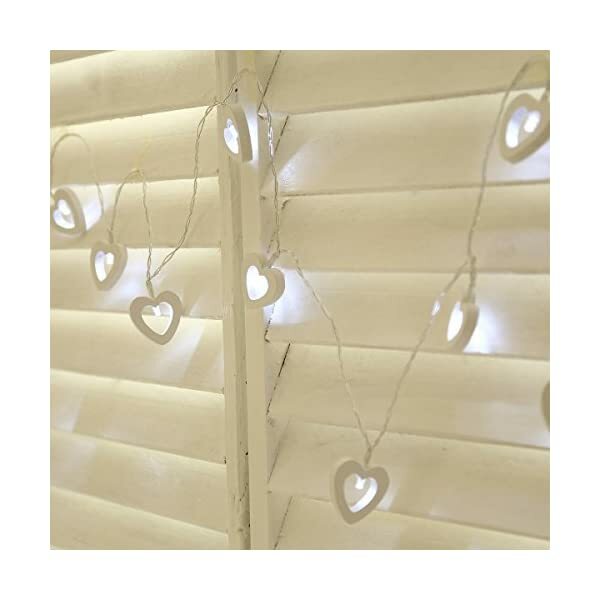 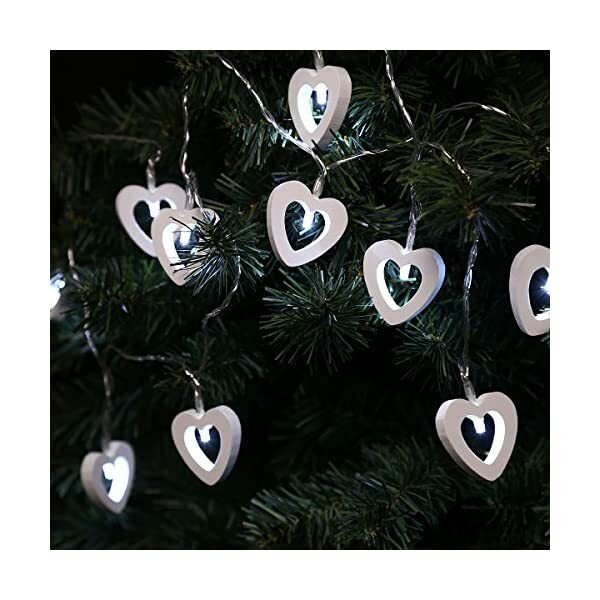 With 2.5M/8FT length string light, equipped with 10 wooden heart-shape white LED lights subtly enhance the shape of the heart by illuminating from the centre, which will reflect lovely if placed around your mirror or a metal bedstead. 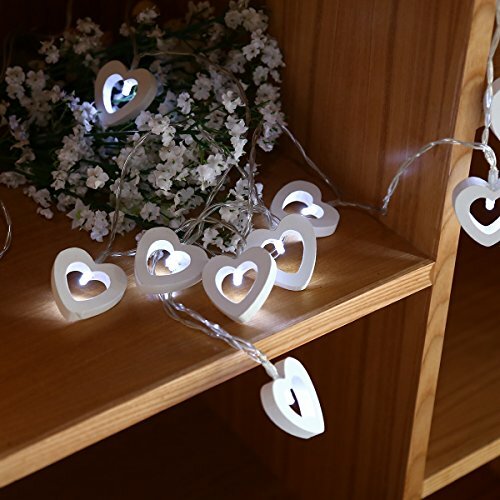 Projecting a suitable glow onto the surrounding area, no-dazzling and comfortable lighting decoration effect. 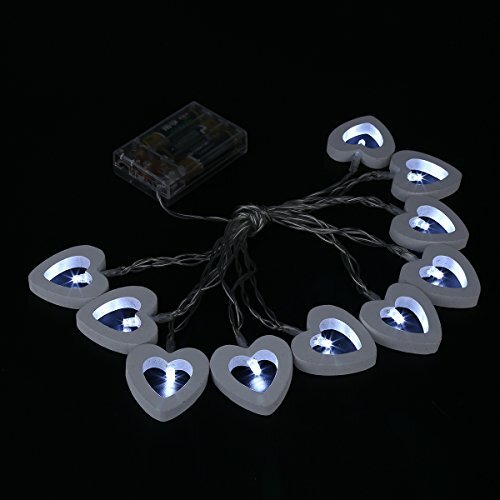 1: IP44 waterproof level, only for water splashing, we suggest you use it under the protection especially in heavy rains. 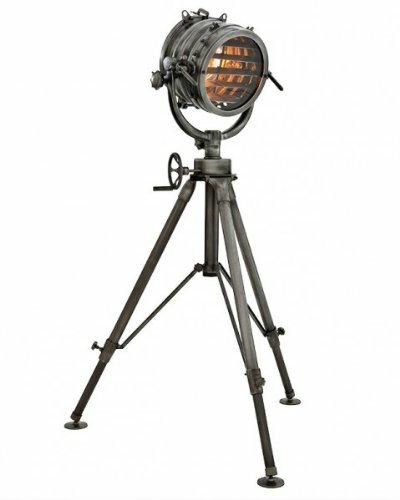 2: Timer for 6 hours ON and 18 hours OFF: Switch the button on the Steady On mode, then the light will last lighting for six hours. 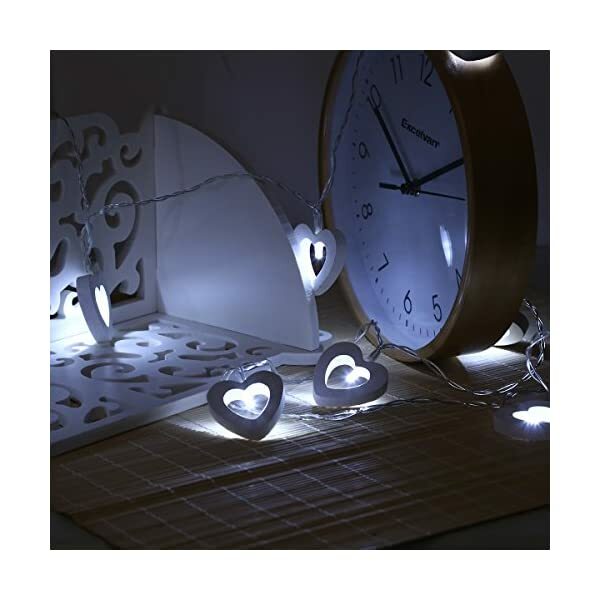 After six hours, the light will turn off automatically. 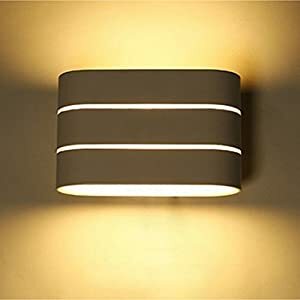 Also, the light will turn on/off in the same certain time on the second day. 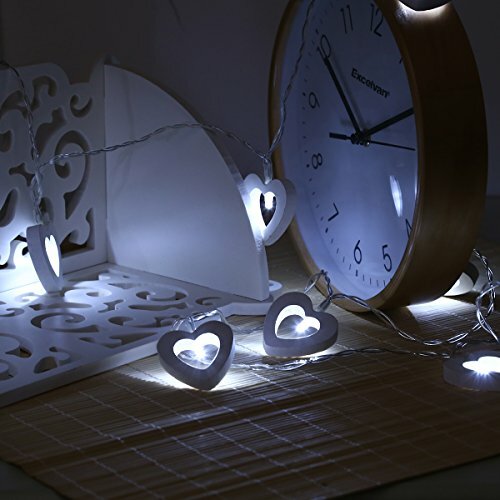 If you want to change the light time, you just turn on the light on the different time, it also lights for six hours and then turns off in a repeated way. 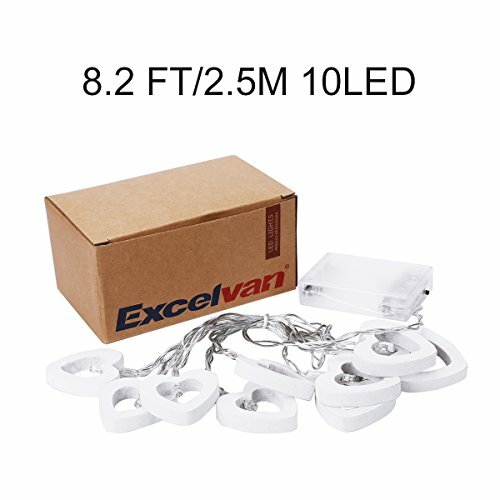 Available for indoor and outdoor use: IP44 waterproof level in case of water splashed, energy-saving, low consumption, low heat, environmental friendly with high quality material for long-time use. 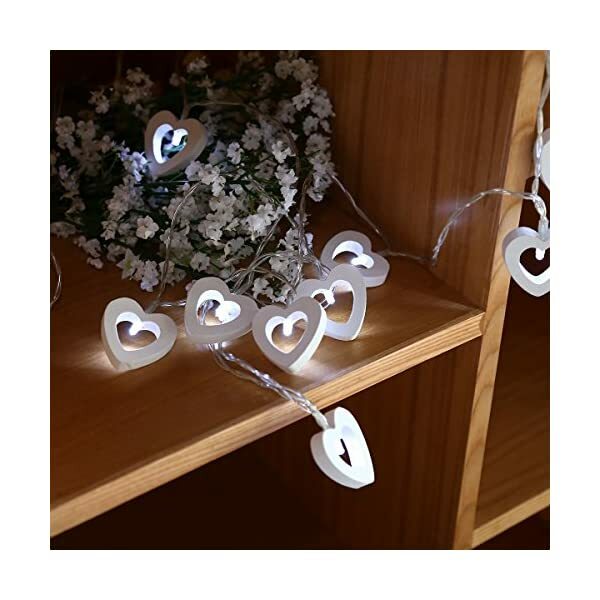 Perfect and wide decoration light: great decoration for your garden, patio, lawn, gate, yard and porch by hanging the string light among almost anything, such as mirror, child’s dolls house, bedframe or even the edge of a shelve or bookcase, anywhere you can imagine, ideal for embellish party, wedding, Christmas, Hallowmas, Thanksgiving Day, New Year and so on.